October 27, 2017 – GINGER HANSON, PH.D., M.S. November 08, 2017 – DEBU TRIPATHY, M.D. November 08, 2017 – LAURIE LEONARD, M.B.A., M.S.W. November 07, 2017 – MIKE HENNESSY, SR.
Nonmedical treatments offering physical and psychosocial relief are gaining respect in the medical community. Karen Albert had never had a massage before she was diagnosed with stage 3B inflammatory breast cancer in 2013. Today, she regularly visits massage therapists at the Dempsey Center in Lewiston, Maine, to alleviate tightness in her muscles resulting from her bilateral mastectomy. She has come to trust and depend on the therapists who, she says, understand what she has been through more than those who might work at another facility that isn’t designed for cancer patients. Actor Patrick Dempsey and his sister, Mary, founded the Dempsey Center in 2008 in their hometown to honor their mother Amanda, who died in 2014 after almost two decades of battling ovarian cancer. The Dempsey Center provides an integrated approach to cancer prevention, education and support. Albert, 52, considers the Dempsey Center a haven, or, in her words, a “safe place,” where she can find not just physical relief, but mental and emotional respite as well. A growing number of patients have access to complementary therapies either at their chosen cancer center or in freestanding facilities such as the Dempsey Center. Both those in treatment and survivors have begun taking advantage of the programs to help themselves heal from the effects of treatment and move forward with additional healing options. The Duke Cancer Center Institute, Mayo Clinic, the University of Texas MD Anderson Cancer Center and many other cancer centers have established complementary programs, each bringing their own focus and distinct programs. In addition, there are researchers such as Barbara Andersen, Ph.D., professor of psychology at The Ohio State University, whose clinical trials’ results have shown increased survival for patients with breast cancer taking part in stress reduction treatment. Albert’s first visit to the Dempsey Center was at the behest of a nurse at Central Maine Medical Center, where she was treated. The nurse encouraged her to take a look at the center while waiting for lab work and doctors’ appointments. She and her husband were greeted by Mary Dempsey, Community Service Coordinator, who showed them around and gave Albert a pillow, beads to keep track of her treatments and information about the evidencebased treatment options offered at the center. “I was crying,” Albert says, “because I had just gotten my diagnosis and she was wonderful.” She was so exhausted during her first round of treatment when she was still working as an accountant that there was no time or energy for visits, but she did become connected during her second bout of cancer in July 2015. She is currently on her third round of clinical trials. Studies on massage show her weekly treatment may also have an impact on her body’s ability to fight the cancer by giving her a range of positive outcomes, such as better sleep, better quality of life, mental clarity and alertness. Massage has been shown to alleviate pain, nausea, anxiety and depression. Albert has also taken part in the Fit for Life exercise program at the center, in addition to the nutrition and cooking program and the yoga and meditation program. In addition, she meets with a therapist who helps her navigate the emotional stress cancer places on the family. Her caregivers, her sister and daughter have also taken part in center programs, which include therapies in mind and spirit; movement and wellness; nutrition and cooking; support groups, and youth and family programs in addition to education and events. In the past two decades, the numbers of patients using complementary therapies has increased significantly. Complementary therapies are not to be confused with alternative treatments, which replace standard therapies. Nor are they to be seen as something only to be used in treatment as most represent a new way of living when treatment has ended, one that will keep their body healthy as they recover and into the future. Today, the use of music, acupuncture, yoga, touch therapies and other complementary therapies is seen as a valuable addition to patients’ treatments as the medical community has recognized the need to focus on the whole person and their quality of life. The goal for many of those running such programs and the medical professionals who have come to rely on them is integrative therapy, which means combining standard and complementary therapies to treat the whole person from the day of diagnosis onward for the rest of their lives. Across the country, cancer centers are adding complementary options either onsite or through free-standing options, such as at the Dempsey Center. The Cancer Support Community, which began as Gilda’s Club in the ‘90s, now has 170 international locations and 47 health care affiliations. Each center has a variety of support groups available to survivors in addition to programs similar to those offered at the Dempsey Center. Adkins says that strong support from the hospital and its foundation have been instrumental in promoting the complementary therapies and have put money toward the program, which now offers art, photography, writing, cycling, gardening, movement, music, strength and fitness for cancer survivors, and special educational programs, such as speakers on a wide variety of topics. The program invites all those touched by cancer, no matter where they were treated. Adkins’ immediate challenge was coming up with programs that could be started during treatment that would not conflict with direct cancer therapy, programs that would focus on the psychosocial. 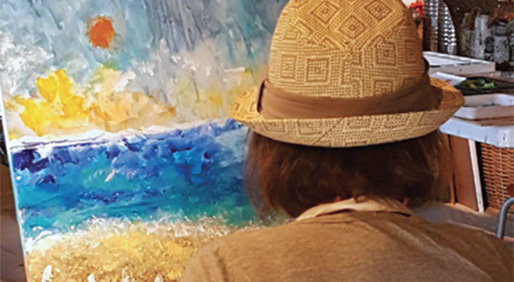 Aside from music therapy for patients in the oncology unit and touch therapy in radiation oncology, the programs are held at other locations in the city, such as a college campus or art gallery. “Our complementary approach is to help in the more subjective area of having cancer and getting through it day-to-day,” he says. In addition, Adkins says, a local college did a study to explore the value of their services for patients and caregivers and found the greatest positive impact was for the caregivers, who Adkins says will be getting more attention in the future. Lori Shutler found out about Sutter’s programs accidentally when she attended the wedding of a survivor friend at an art gallery in Modesto where the center held art classes. “She told me she had signed us up for the art class,” says Shutler, who was a first-grade teacher and almost finished with her Master’s degree when she was diagnosed with stage 4 breast cancer in 2009. She was out of work for a year, stopped her college classes and was forced to return to teaching so she would have insurance. Studies conducted in the past five years show the varying attitudes of oncologists toward complementary therapies. Most of these oncologists see them as an important service despite the fact that “their knowledge of the subject is often limited,” according to the journal, Supportive Care in Cancer. The lack of standards, training and even basic definitions has left physicians with few guidelines about which complementary therapies they can recommend and how to find trained therapists. Albert’s oncologist quizzes her at each appointment about the programs she has been involved in at the Dempsey Center, but it is all positive, she says. Just as physicians reach out to learn more about complementary therapies for their patients, right now, patients across the country, for the most part, have to determine which therapies would work for them and their particular cancer. Many physicians need more training on treatment options as well as on education and communication techniques to use with patients. It is an ongoing conundrum that researchers, patients and physicians are continually facing.